Feeling nostalgic? Now you'll rave! Here's the story of Burma Shave. I CAN REMEMBER TAKING A TRIP AS A CHILD AND SEEING MY FIRST BURMA SHAVE SIGNS. Technically speaking, after 1963 all the 7,000 or so sets of signs were supposed to have been taken down. Still, my discovery may not have been unusual, since even today sightings abound (though they're not as frequent as Elvis or Bigfoot sightings). It's possible that some of the thousands of signs that dotted the countryside were never taken down, or perhaps (and more likely) they are the work of some nostalgic farmers who recreated them. 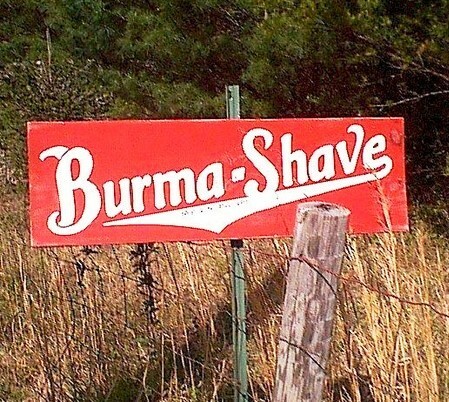 Like many great success stories, Burma Shave started by happenstance. 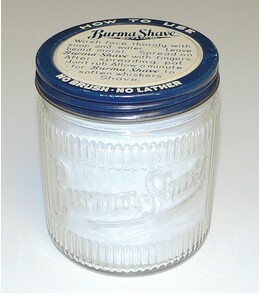 Burma Shave, a brushless shaving cream, was concocted by the Odell family. Its predecessor product, a liniment called Burma Vita, was not doing very well in sales, due to competition and to the fact that it could only be sold to people who were ill. It was suggested that it would be more profitable to market a product that could be used every day, such as Lloyd's Euxesis from England. This was the original brushless shaving cream that was available world-wide. A chemist was hired (Burma-Vita was one of grandfather Odell's homemade concoctions) and after about 300 mixtures were tried, Burma Shave was born. However, inventing the product was only the beginning of a long journey to success, and the product almost died several times because of poor marketing. One of the marketing schemes was called "Jars on Approval," in which the Odell boys would enter a man's office and give him a jar of Burma Shave on this basis: if he liked the product he would pay them 50¢ the next time they saw him. If he didn't like Burma Shave they would take back the unused portion and "remain friends." Then one day, Alan Odell came up with a suggestion. He suggested roadside signs like the ones he had seen on road trips when he was out trying to sell Burma-Shave. However, his father would not hear of such a crazy idea, and was sure that the boy was just homesick because of all the travelling he was doing. Alan continued to lobby for his idea and finally his father gave in and gave him $200 to try out his idea. The signs were put up in a hurry before the ground froze solid on two roads leading out of Minneapolis. There were about a dozen sets of signs put up on the two roads. Not too long after that, the first repeat orders for Burma Shave were received from drugstores because the people who travelled the two roads where the signs had been installed began asking for Burma Shave from area drugstores. 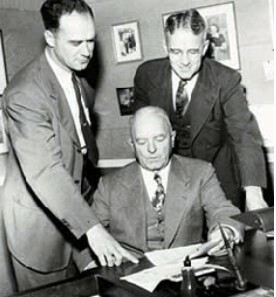 At this time, the business was broke, so the company was incorporated and 49% of the stock was sold to raise capital. 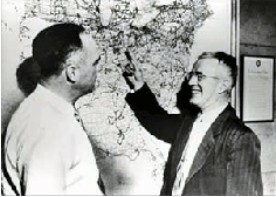 Within three weeks, the shares had been sold, and in early 1926 the first sign shop was set up. The next year, Allan and his brother Leonard set up more signs, spreading across Minnesota and into Wisconsin, spending $25,000 that year on signs. Orders poured in, and sales for the year hit $68,000. Eventually, the signs spread to every state, with a few exceptions. No "official" signs appeared in Arizona, New Mexico, or Nevada because of low traffic density. Massachusetts received no signs because winding roads and excessive foliage made it hard to find enough locations to justify placing them there. The slogans were very powerful, and worked so well that that the Burma Shave Company did not even feel the effects of the Depression. The world's economy may have been depressed, but men still had to shave. At their height of popularity there were 7,000 Burma-Shave signs stretching across America. They became such an icon to these early day travelers that families eagerly anticipated seeing the rhyming signs along the roadway, with someone in the car excitedly proclaiming, "I see Burma-Shave signs!” Breaking up the monotony of long trips, someone once said, "No one could read just one." World War II was not ignored by the Burma-Shave writers—not on its road signs nor in magazines and newspapers. Although the Burma-Shave Company prospered, there were many challenges, too. Not only was there fierce competition, there was also the need to come up with a continuous supply of superior verses. The company solved that with an annual contest that paid $100 for each verse used. There were thousands of entries sent in, resulting in many rhymes of high quality. Judging the entries eventually became difficult because in some years there would be more than 50,000 entries. This forced Burma-Shave to hire advertising copywriters to help in the selection process. Like Every One Else Is Nuts! There are some funny stories in the history of the Burma-Shave Company. In Los Angeles, free sample jars were handed out to men as they entered a wrestling match. However, when one of the wrestlers angered the crowd, some of them started to throw their jars into the ring. Fortunately (and probably miraculously) no one was hurt . . . a close shave for the company, so to speak. A similar occurrence happened at Ebbets Field in New York. Tubes of Burma-Shave were handed out to fans entering the game, but when the umpire made a call unfavorable to the Dodgers, he was pelted with the tubes. The game had to be interrupted until the groundskeepers could remove the tubes. Another problem that arose was that the Burma-Shave signs had a tendency to disappear near college towns. To remedy this, special bolts were used, so that a special tool was necessary to unbolt the signs, and the posts had crosspieces attached to the bottoms to act as anchors. Another problem in rural areas was the tendency for hunters to use the signs for target practice. Some destruction was also caused by small animals that seemed to like to chew on the signs. However, much more damage was attributed to horses that found them to be an ideal height for back scratching. A cow or horse would maneuver itself beneath the bottom edge of a sign and then begin to scratch the itch. This would often result in a broken sign. The problem was solved when many of the signs were raised to ten feet high. Fenders began to arrive in the mail and by express, and local people scavenged the Minnesota junkyards and brought in fenders. Some fenders from toy cars also came in, and without exception, everyone who brought or sent in a fender received a free half-pound jar of BURMA-SHAVE. Of course, the publicity from the bumper offer was priceless and further helped to establish the company as part of America's roadside culture. The manager of a supermarket in Appleton, Wisconsin, took up the challenge and wrote to the company asking where he should send the 900 jars for his free trip. The company sent back the following reply: "If a trip to Mars you'd earn, remember, friend, there's no return." In reply, the enterprising supermarket manager accepted. He turned the project into a fantastic promotion for Burma-Shave that had children and adults swarming the supermarket. The promotion included no less than a rocket plane on display and little green men on the roof firing toy rocket gliders into the parking lot. The Burma-Shave company decided to send the manager and his family to Mars. The real destination was to be Mars, Germany. (Even though it is spelled Moers, it is pronounced Mars.) Again, the publicity was enormous, especially when the manager showed up wearing a silvery space suit and a bubble on his head. The company, of course, provided him with extra jars of Burma-Shave so that he could barter with the Martians. It is said that all good things must come to an end, and this was the case with BURMA-SHAVE. There were a number of factors that led to the decline of the product. After World War II, increasing costs and decreasing sales began to be felt by the company. People were travelling faster on the highways and times were changing. The signs just weren't working as well anymore, and the company started to advertise more with other media. BURMA-SHAVE sales rose to about 6 million by 1947, but sales stagnated for the next seven years, and then gradually began to fall. Various reasons caused sales to fall, the primary one being urban growth. Typically, BURMA-SHAVE signs were posted on rural highways and higher speed limits caused the signs to be missed or ignored. Subsequently, the Burma-Vita Company was sold to Gillette in 1963, which in turn became part of American Safety Razor, which was then part of Phillip Morris. The huge conglomerate decided the paying rent to farmers who displayed the signs was an unecessary expense for a silly idea - and another of America’s vintage icons was lost to progress. Most of them may be gone now, but they're not forgotten. Here's one more that's just as true today as it was back then. and how they changed over the years, click on the sign below.